Iran's controversial nuclear programme and Syrian crisis dominated the opening day of 16th Summit of Non-Aligned Movement here today, with India calling for 'coordinated global action' to deal with proliferation of weapons of mass destruction and international terrorism. In a delicate balancing act, Prime Minister Manmohan Singh voiced India's opposition to 'external intervention' in Syria, while making a pointed reference to the situation in the West Asian region, before the leaders and other representatives from over 50 NAM countries who are in Teheran for the two-day Summit. He particularly referred to Syria, which is currently afflicted by a civil war between troops loyal to President Bashar Al-Assad and the rebels. 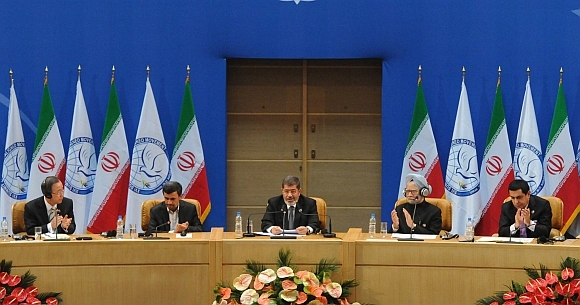 Earlier, inaugurating the Summit, a defiant Iran said it will not 'forgo' its right to peaceful use of nuclear energy. "Iran has never been after nuclear weapons and that it will never give up the right of its people to use nuclear energy for peaceful purposes," its supreme leader Ayotallah Khamenei said on the contentious nuclear issue. He slammed the UNSC as a 'flagrant form of dictatorship' while terming the US and its Western allies as 'bullies' trying to monopolise nuclear fuel production. Khamenei also said that the sanctions imposed on Iran have only made 'our steps steadier, elevated our resolve and strengthened the confidence'. His address followed the speech of United Nations Secretary General Ban Ki-moon, who asked Iran to build international confidence regarding its nuclear programme and comply with all its international obligations under the NPT. The opening day of NAM also witnessed some awkward moments when Egyptian President Mohamed Morsi said that it is an 'ethical duty' to support the Syrian people against the 'oppressive regime' in Damascus. Morsi's speech prompted a walkout by the Syrians, the Al-Jazeera channel reported, though there was no independent confirmation of this. The Egyptian President's remarks are an embarrassment to Iran, which has been an open supporter of the Assad regime. Morsi's visit to Iran is the first by an Egyptian leader since the Islamic Revolution of 1979. Addressing the NAM Summit, Iran's President Mahmoud Ahmadinejad accused the US of killing people in 'large numbers and in organised ways' in Afghanistan, Iraq and Pakistan and also blamed the UNSC for the crisis in the Middle East. He also said that the grouping of 120 nations should reconsider its goals and aspirations to have a part in governance of the international community. 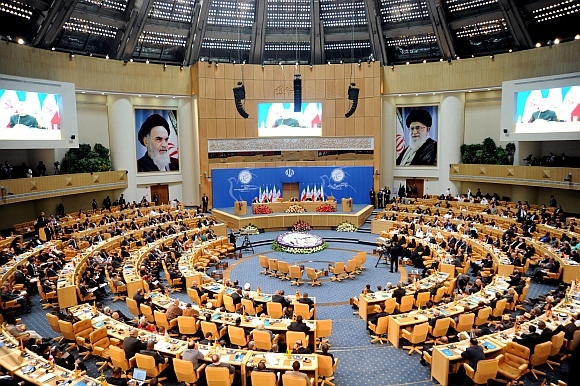 Coming in the midst of reservations expressed by the US and some other western countries, Tehran is projecting the 16th NAM Summit as a big diplomatic victory, notwithstanding the sanctions and other financial restrictions imposed on it. The Summit, attended by over 30 heads of state and government, is being held after a two-day experts' meeting and a conference of the Foreign Ministers of the NAM member states which also lasted for two days. 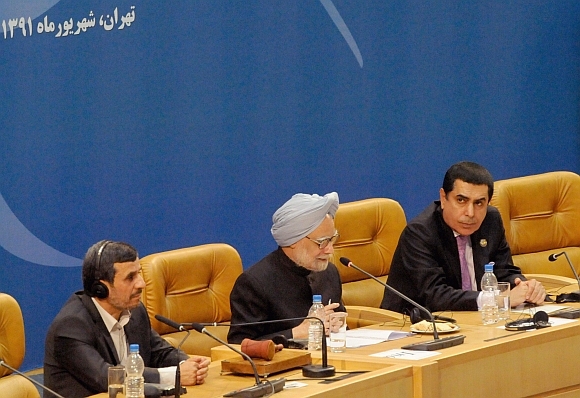 Prime Minister Singh, in his address to the Summit, said that the West Asian and North African region is undergoing profound change. Singh said, "As the world's largest democracy, India supports popular aspirations for a democratic and pluralistic order. Nevertheless, such transformations cannot be prompted by external intervention, which exacerbate the suffering of ordinary citizens. "The deteriorating situation in Syria is a matter of particular concern. Our Movement should take a stand on the issue in keeping with universally accepted principles," he said while urging all parties to recommit themselves to resolving the crisis peacefully through a Syrian-led inclusive political process that can meet the legitimate aspirations of all Syrian citizens." The 17-month-old conflict in Syria has left more than 25,000 people dead, according to rights groups. The UN refugee agency warned on Tuesday that as many as 200,000 refugees could flee to Turkey to escape fighting in Syria -- almost double the number Turkey has said it can take. Among the key leaders attending the NAM Summit are Pakistan President Asif Ali Zardari, Afghan President Hamid Karzai, Bangladesh Prime Minister Sheikh Hasina and Bhutanese Prime Minister Jigmi Thinley. The Non-Aligned Movement, the rotating presidency of which was conferred to Iran on August 26, comprises two-third of the UN member states and was established in 1961 in Belgrade.